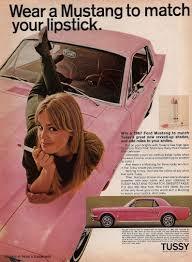 Does this car match my lipstick? I have stumbled upon the most amazing treasure–a book written in 1917 called Woman as Decoration by Emily Burbank, a visual artist’s point of view about how to complement one’s surroundings by what one puts on one’s body–what to wear while sitting in your sun-room, say, or walking in your garden, or ice skating, to form a pretty picture for anyone who happens to be looking. I’ve never read anything quite like it, and I must confess, I’m having a hard time putting it down. I’m dying to share more tidbits from this book with you, and I will, but in the interest of time I will begin with this brief but delightful description of what to wear while motoring, to expand on my earlier post about the well-dressed motorist. Just something to keep in mind as you zip around town in your mini-van or Range Rover this weekend! IT is not easy to be decorative in your automobile now that the manufacturers are going in for gay colour schemes both in upholstery and outside painting. A putty-coloured touring car lined with red leather is very stunning in itself, but the woman who would look well when sitting in it does not carelessly don any bright motor coat at hand. She knows very well that to show up to advantage against red, and be in harmony with the putty-colour paint, her tweed coat should blend with the car, also her furs. Black is smart with everything, but fancy how impossible mustard, cerise and some shades of green would look against that scarlet leather! An orange car with black top, mud-guards and upholstery calls for a costume of white, black, brown, tawny grey, or, if one would be a poster, royal blue. Some twenty-five years ago the writer watched the first automobile in her experience driven down the Champs Elysées. It seemed an uncanny, horseless carriage, built to carry four people and making a good deal of fuss about it. A few days later, while lunching at the Café de Reservoir, Versailles, we were told that some men were starting back to Paris by automobile, and if we went to a window giving on to the court, we might see the astonishing vehicle make its start. It was as thrilling as the first near view of an aëroplane, and all-excitement we watched the two Frenchmen getting ready for the drive. Their elaborate preparation to face the current of air to be encountered en route was not unlike the preparation to-day for flying. It was Spring—June, at that—but those Frenchmen wearing very English tweeds and smoking English pipes, each drew on extra cloth trousers and coats and over these a complete outfit of leather! We saw them get into the things in the public courtyard, arrange huge goggles, draw down cloth caps, and set out at a speed of about fifteen miles an hour! The above seems incredible, now that we have passed through the various stages of motor car improvements and motor clothes creations. The rapid development of the automobile, with its windshields, limousine tops, shock absorbers, perfected engines and springs, has brought us to the point where no more preparation is needed for a thousand-mile run across country with an average speed of thirty miles an hour, than if we were boarding a train. One dresses for a motor as one would for driving in a carriage and those dun-colored, lineless monstrosities invented for motor use have vanished from view. More than this, woman to-day considers her decorative value against the electric blue velvet or lovely chintz lining of her limousine, exactly as she does when planning clothes for her salon. And why not? 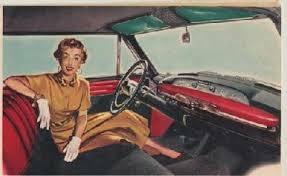 The manufacturers of cars are taking seriously their interior decoration as well as outside painting; and many women interior decorators specialise along this line and devote their time to inventing colour schemes calculated to reflect the personality of the owner of the car. Special orders have raised the standard of the entire industry, so that at the recent New York automobile show, many effects in cars were offered to the public. Besides the putty-coloured roadster lined with scarlet, black lined with russet yellow, orange lined with black; there were limousines painted a delicate custard colour, with top and rim of wheels, chassis and lamps of the same Nattier Blue as the velvet lining, cushions and curtains. A beautiful and luxurious background and how easy to be decorative against it to one who knows how! Another popular colour scheme was a mauve body with top of canopy and rims of wheels white, the entire lining of mauve, like the body. Imagine your woman with a decorative instinct in this car. So obvious an opportunity would never escape her, and one can see the vision on a Summer day, as she appears in simple white, softest blue or pale pink, or better still, treating herself as a quaint nosegay of blush roses, forget-me-nots, lilies and mignonette, with her chiffons and silks or sheerest of lawns. 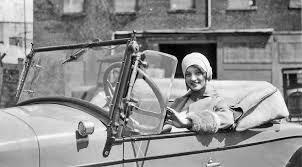 “But how about me?” one hears from the girl of the open car—a racer perhaps, which she drives herself. You are easiest of all, we assure you; to begin with, your car being a racer, is painted and lined with durable dark colours—battleship grey, dust colour, or some shade which does not show dirt and wear. The consequence is, you will be decorative in any of the smart coats, close hats and scarfs in brilliant and lovely hues,—silk or wool.